Pertamina Gas as a business entity conducting procurement of goods/services appropriately, a flexible, efficient and effective in order not to lose business momentoum which can result in losses, so that the necessary guidelines for the implementation of the Goods/Services that can meet the needs of the business with due regard to the principles of efficient, effective, competitive, transparent, fair and reasonable and accountable. Optimization of procurement processes of Goods/services need to be done as an effort to increase company profits from the aspect of cost reduction, while still continue to support the Company's operations in the quality, availability and delivery. 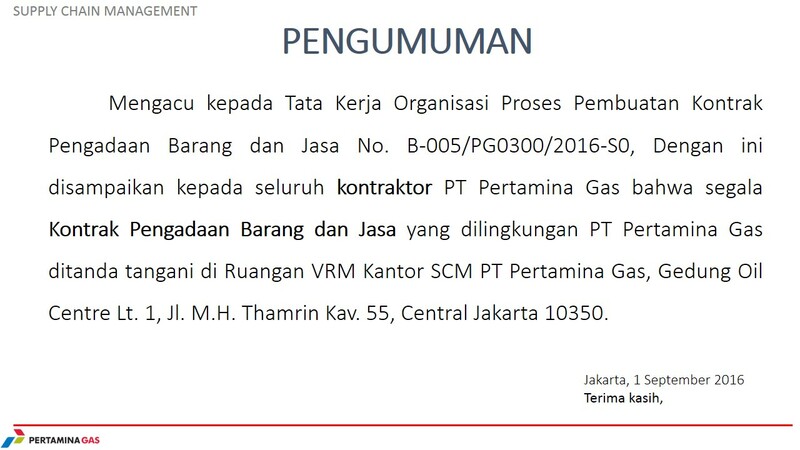 DIn the process of procurement of goods/services, companies relying on Pertamina Incorporated Synergy and BUMN Synergy..